Mama's Cup: Bubbles & Bathtime Basket Giveaway! As promised, here is another giveaway from the generous people at Kiss My Face! This one is perfect for Mamas because it's full of the new Kiss My Face Obsessively Natural Kids line. 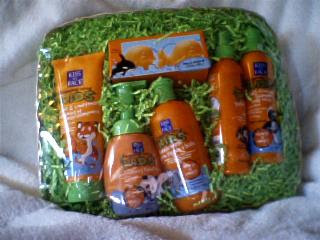 This basket contains six new bathtime products for kids, including shampoo, hand wash, body wash and a detangler. All products are "totally natural" with "no artificial colors or fragrances...no parabens and no SLS." I'm letting this giveaway run until tomorrow morning, 9:00 AM Eastern Time. Post a comment here and tomorrow morning, we'll print them out and choose one at random. Hey yeah, count me in! Wonderful giveaway! Hope to win even though I am first to comment which seems like bad luck! Wow, I never heard of these. How great! Wow sounds like a great giveaway, got to love a product that has all those attributes! Yay, I am able to be involved in the one! :) Looks like beautiful stuff. It would be perfect for me AND Cooper! My 2 yr old would do great with this & I am so looking for more organic products to use on his sensitive skin. Thanks for the opp to win!